A versatile craft for those who desire an all purpose boat. Easy to row. Topper has all the big boat features too: V-Bottom Design, Girder Construction, full length Spray Rails, Plus many exclusive Topper features. It's easy to carry and lifts easily on to the car top carrier. 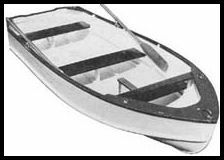 COMPLETE BOAT KIT Includes all the framing members, seat tops, front deck, stem, keel, etc. of solid cypress lumber, marine plywood planking and transom, all pre-cut and ready to assemble. The Topper's basic framework sets up in a few minutes. Frames and Girders are notched and interlock making rapid assembly possible. Kit also includes silicon bronze screws and nails, marine glue, and instructions. SAILING KIT INCLUDES: Aluminum mast and cypress boom. Daggerboard and trunk parts from marine plywood and solid cypress. Mast strut, tiller arm and mast step from cypress. 3/4" marine plywood rudder. All parts are pre-cut. All rigging hardware, rudder fittings, fasteners and line are included. 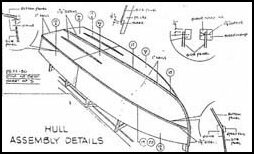 STEP BY STEP Drawing is one of many Step by Step assembly drawings supplied with our boat kits. Note all kit parts are pre cut and are numbered to correspond with the drawings for easy assembly.